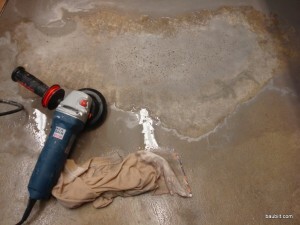 I have finished concrete floors in my lower level. I like them quite a lot. However, the area under my chair at my desk had developed some spalling. The spalling is a crumbling of the top surface of the concrete. I believe this is caused by a failure of the surface layer, which is comprised of the concrete “fines” which float to the top during troweling. I suspect that some gritty material gets on the caster of the office chair and with repeated rolling causes some little compression cracks, which then spread. The spalling was not deep, but I suspected it would get worse if I did not deal with it. Grinding and polishing concrete floor to repair spalling.